^ Ohno, Shun (2006). 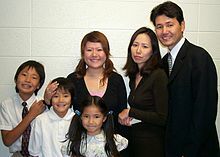 "The Intermarried issei and mestizo nisei in the Philippines". In Adachi, Nobuko. Japanese diasporas: Unsung pasts, conflicting presents, and uncertain futures. p. 97. ISBN 978-1-135-98723-7. ^ "International Religious Freedom Report 2006". Bureau of Democracy, Human Rights, and Labor. U.S. Department of State. 15 September 2006. Retrieved 4 December 2007. ^ Furia, Reiko (1993). "The Japanese Community Abroad: The Case of Prewar Davao in the Philippines". In Saya Shiraishi; Takashi Shiraishi. The Japanese in Colonial Southeast Asia. Southeast Asia Program, Cornell University Publications. p. 157. ISBN 978-0-87727-402-5. Retrieved 30 May 2016.